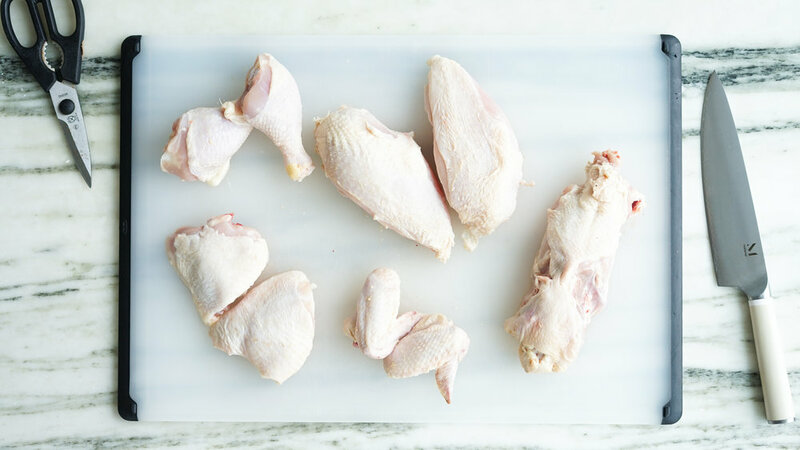 Everyone always worries about how to cut up a chicken and they ask “why cut up a chicken when I can buy it already butchered in a grocery store?” The answer is simple: you will save so much money if you buy a chicken yourself, just as long as you know how to cut it up. Today I’m going to teach you to cut up a whole chicken. It may seem scary but if you know the right steps you can actually end up saving money in the long run, making multiple meals at once… AND you get the backbone to make a stock. To start, make sure the chicken is breast side-up. We’re going to cut off the thighs, slice the skin between the breast and the leg and pop out the joint. Run your knife along the edge of the bird, and the thigh should easily release. Repeat with the same side. slice, pop, and release. Next are the wings. Feel for the joint, slice around the sides of the joint and it should release. Now it’s time to remove the back bone from the breasts. Follow the fat line on the breast and cut to on both sides until the back bone is released. Save that for some chicken stock. Using the heel of your knife, pop open the breast bone. Now you’ll easily be able to remove the breasts from each other. You can leave the chicken like this or cut the drumsticks off of the thighs. But along the fat line of the wing and you should be easily able to separate the bone and the thigh. There you have it, one chicken that yields 2 thighs, two wings, one back bone, two breasts, and two drumsticks.